Some people develop ingrown toe nails from repeated trauma like football players, faulty footwear, injury or fungal infection that has destroyed the nail. The ingrown portion seeps into the nail bed causing pain and predisposing the tissue to infection. 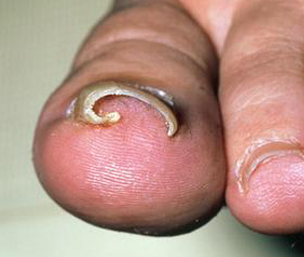 Such ingrown toe nails can be removed by surgery. The ingrown toe nail can be removed partially or completely depending on the extent of injury to the nail. The toe is first numbed with an anesthetic injection. Then the affected part of the nail and attached Nail bed is removed. Nail bed i.e the area under the nail is responsible for the generation of the nail. In case of a deformed nail, due to any reason, leaving back the nail bed will allow regrowth of the nail in the same deformed manner. Hence it is essential that nail bed be removed. In case of complete involvement of nail, the whole nail is removed so that after healing, in place of nail, there is only skin.